If you have a daughter then you can probably remember her first day of ballet and fluffy tutu's and pink leotards. I remember my daughters first days of ballet, I even remember my first ballet recital and dancing to I'm a little Tea Pot. One this day one sweet little girl will celebrate her birthday with tutu's, dancing, face painting and a tower of fluffy cupcakes. 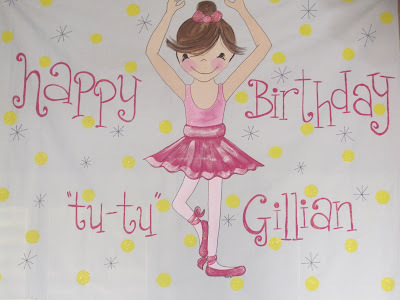 This banner was there to greet her guest and what a great job it did, and a super decoration it made. I'd have such a hard time taking it done (La Nae -the Mommy said the same thing). It was made here in Brenham by a local artist. Adorable isn't enough said about it - it's just so so so so CUTE! 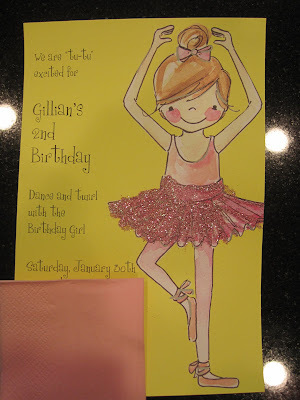 The ballerina's invitation (sorry I had to hide the address and phone number), notice the banner and invitation are similar. 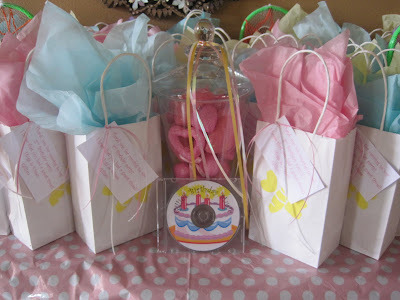 The party favors, notice the party tags (La Nae-the mommy, said she saw this on my blog) and look at the CD (again another Green Acres Brenham blog post). La Nae is so sweet and such a fan of my blog, I love that she asked me to come over and fluff a little and take a few photos to share with everyone. 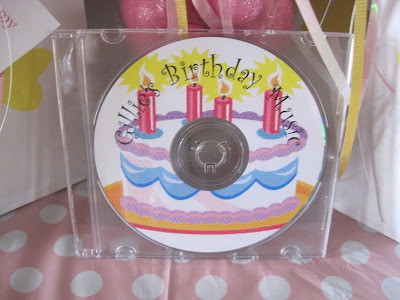 I wonder if Dancing Queen is on the CD? 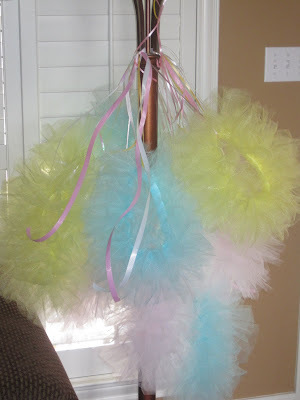 You couldn't be a ballerina without a tutu, so each little girl was given a tutu to wear. 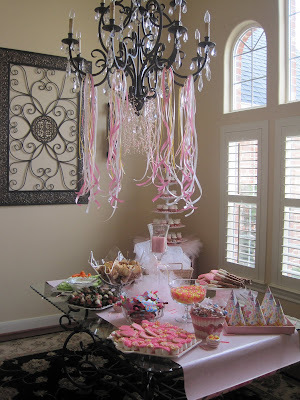 The chandelier was fluffed up with ribbon and beads,it was fun,I liked it. La Nae used wrapping paper (like I used back in an October post) as a runner for the table and lots of yummy treats to eat. Notice the sugar topped marshmallows, a post from the past. Again La Nae such a great supporter of Green Acres Brenham, gotta love her. But, I love all my reader. Your comments and email are so kind and re-energize me. This is precious, a cupcake tower. The cupcakes were make by Brenham Olde Towne Bakery and the tower is available through them (rental). La Nae had the tutu made to fit about the base of the tower, which MADE the tower! 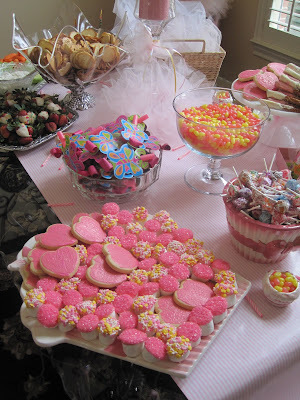 The cupcakes were iced with white icing and heart or pink icing and heart. I assembled the tower by assorting the cupcakes and then adding simple curl ribbon here and there to each level of the tower. 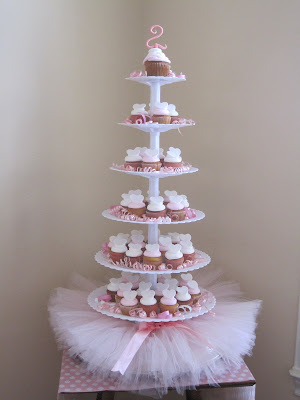 I loved the cup cake tower, they are becoming more popular, but who doesn't love, love, love a cupcake. Plus you can make everyone happy and get all kinds of flavors of cakes and icings when ordering cupcakes. Another thing to keep in mind when ordering cupcakes - think MINI's. Mini cupcakes are also so cute and mixing the cupcake sizes as well as the flavors. Fun and Yummy. After all was set up and looking precious and basically ready to go and waiting for the children I (with my camera,I never leave home without) headed out. I am sure the party was a success and all was a hit. Happy Birthday Gillian and Happy Birthday La Nae. What a great mom she had her daughters birthday party on her own birthday. Kids first. We love our babies, big or small. I'll post next on how to make the clipboards from Wonderboards Boys party.